A sharp folding knife is a great tool if you need to cut things or defend yourself. 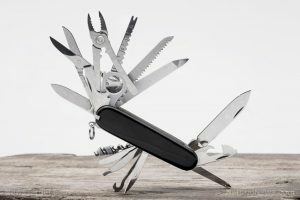 A Swiss knife or a multi-tool can be a more practical option as long as it isn’t too heavy. A small compass can help you keep track of your bearings — useful when you’re hiking through unfamiliar terrain. A length of paracord can always come in handy whenever you need to tie things together. It should be durable enough to help you carry heavy weights. You can buy pre-woven paracord bracelets or you can choose to weave one yourself. A mini LED flashlight or penlight can provide a useful light source when you are bugging out in the dark. Ideally, you should get one that is waterproof. Lightsticks might not be as bright as flashlights but they don’t rely on batteries, so they can provide a constant source of light for several hours. A pot hanger hook can give your water bottle more functionality by providing an easy way to pull it off a fire if you’re using the it to boil water. If you suddenly need to start a fire, you can easily start one with a disposable lighter or some matches. If you can, try to pack some windproof and waterproof matches. You can start a fire with a lighter or a few matches, but some flammable items can help your flame grow quickly. You can pack some cotton balls or tinder tabs, or you can even make your own homemade tinder in the form of wax-coated jute twine. Duct tape can often be a prepper’s best friend. It is useful for makeshift repairs. Nearly anything that needs to stick together will remain stuck with the help of duct tape. A small sewing kit or repair kit should have all the items you need to make quick clothing repairs. These items include safety pins, needles, thread, buttons, and a large sail needle. You can even fit these items in a small Altoids tin if you want, as long as you secure it properly. Learn more tips on making your own survival kit by going to Survival.news.